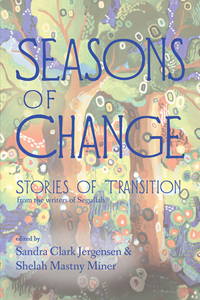 For over a decade, Segullah has been sharing women’s stories in our journal, blog and publications. Our first two anthologies, The Mother in Me and Dance with Them, focused on narratives of motherhood. While those stories are profound, we wish to recognize a broader scope of experience in our third offering. There are so many ways we learn, share and are reshaped through a spectrum of transitions. We crave the catharsis of writing through the change. We write trying to understand the cycles of life and embrace our reshaped selves. Joining the Church or re-examining our faith; falling in love or sharing a marriage bed for many years; sending children out on their own or taking estranged parents back into our lives; illness, divorce and new careers—all of these changes (and more) force us to examine, regroup and adapt.